How the computer accepts input for keyboard? Keyboard is one of the most used input devices. Keyboard is a device with keys for alphanumeric characters along with various other keys to assist using the computer by sending instruction to the computer. The process of sending an instruction to the computer from keyboard when a key in the keyboard has been pressed is described below. The first step is to press a key in the keyboard. A tiny chip called keyboard controller will take action as a key has been pressed and will store the key code to a memory called keyboard buffer. A buffer is a volatile memory that holds data until they can be processed. 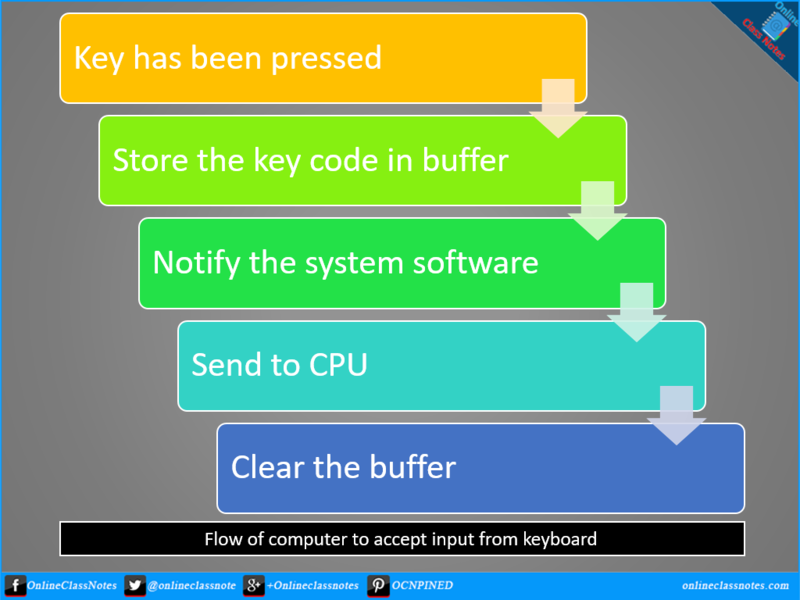 The keyboard controller then sends an interrupt request to the system software to read the key code from it's buffer. The system software, when it's convenient, reads the key code from the keyboard buffer and sends the key code to CPU for further processing. After the key code being read by the system software, it will be removed from the keyboard buffer.